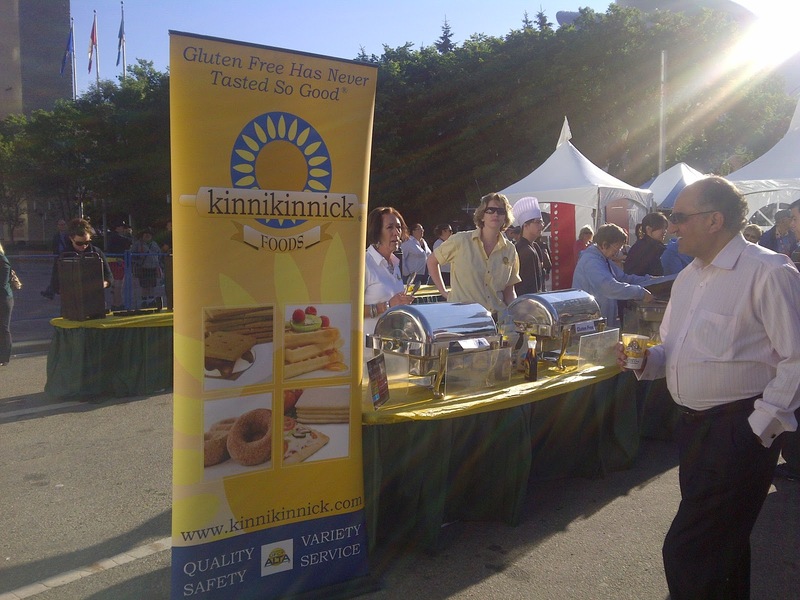 We just wanted to thank the Celiac Association and Kinnikinnick for the amazing week last week of Gluten Free Pancake Breakfasts. First, was Kinnikinnick stepping up to the plate for the Capital Ex Pancake Breakfast where they served up over 250 gluten free pancakes and Grimms gluten free sausages at Churchill Square. 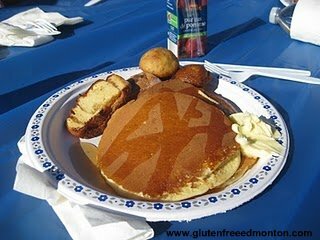 Then thank you to the Edmonton Chapter of the Celiac Association for putting on such a great Gluten Free Pancake Breakfast held at the Kinnikinnick store. So if you are off in Toronto at all, you gotta check out Green Papaya at Yonge and Eglinton. We had eaten there once before during a visit and really liked it. This time back, we ate their again, and realized that it was fantastic and certainly the best gluten free menu we have come across. Their gluten free menu is quite extensive and plenty to choose from. It was actually hard to choose our meals! Both Amanda and I ate gluten free their. 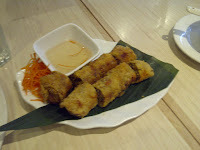 The one thing Amanda had to try was their gluten free crispy spring rolls. They were so good! I managed to snap a picture before we ate it up. But I was not so lucky for the rest of the meal, we were so excited by the spring roll that we dove right into our meals and forgot to take a pic! But get this, they offered a 3 course set mail for 16.99 that included a coconut soup for the appetizer and for the main course it was chicken satay, with shrimp, padthai and a mango salad. Oh and of course mango ice cream for dessert. Yum! 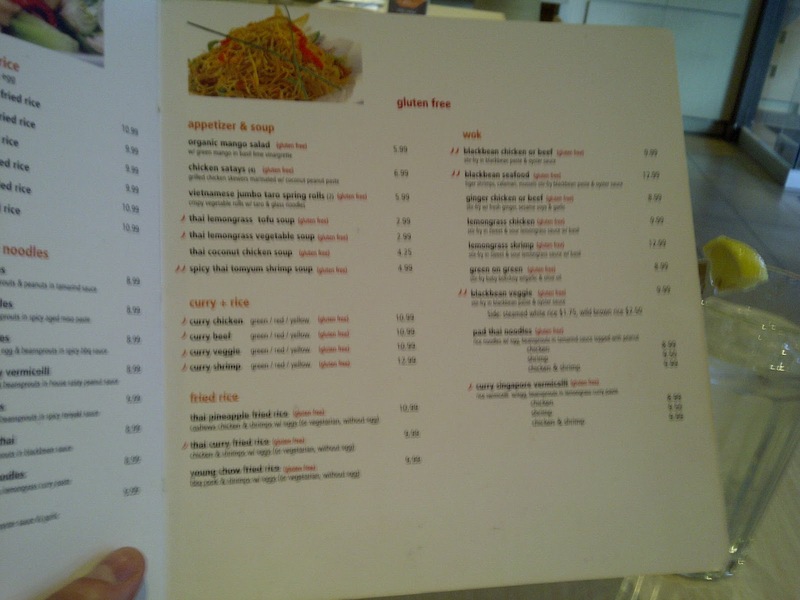 Click here to view the Green Papaya menu. Scroll to the bottom for info on the gluten free menu. 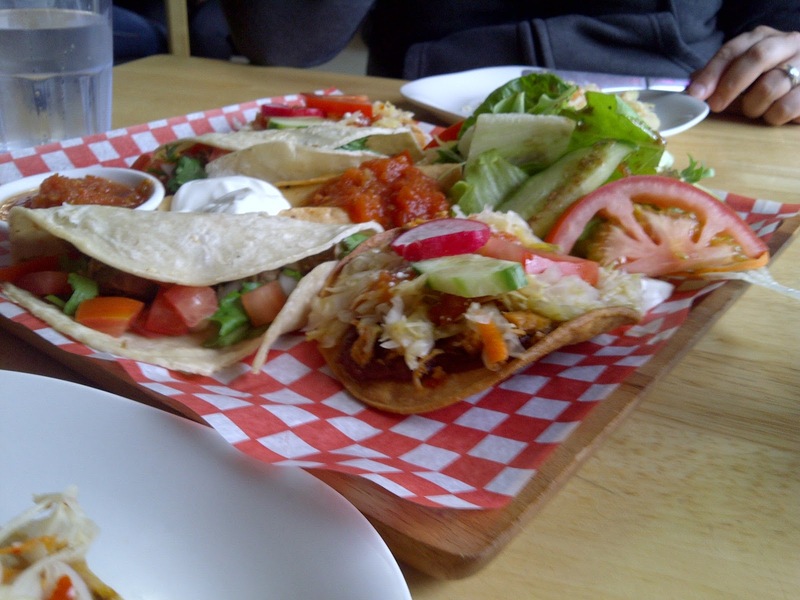 Want other ideas of where to go for gluten free in Toronto? Check out the travel section. So it's no secret, once someone knows you have Celiac, they essentially start to 'look out for you'. A while back I walked into my office with a photo copy of a menu from El Rancho's Spanish Restaurant. 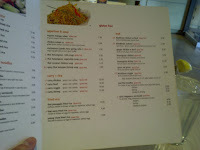 The menu had C's all over it for Celiac friendly menu items. Was great, lots of C's to indicate gluten free. It didn't take long for us to decide to go their. El Rancho is located in the heart of the 118 Ave. rebuild. What an effort that area is making, and it was great to see such a great restaurant continuing to operate in that area and have a totally renovated building. My colleague suggested suggested we try the 2 Amigo's Platter. It had 2 Flautas, 2 tacos and 2 enchiladas salvadorenas with an El Rancho salad for 16.95. For an appetizer we each had a pupusa ($2.75/each). As you can see by the photo, the platter is plenty of food. The platter also included some salsa for your taco's and a scoop of sour cream for your flautas. The little bit of salad was just perfect to munch on between each item. Would we recommend this restaurant with its gluten free options? Heck ya! I knew this was going to be a great authentic food, when I saw 'mom' walk out of the kitchen to say hi to some guests from the community. Always a good sign! Anyways, he spoke to the owner, Helen, and she assured him that she makes the broth for the Pho from scratch using several different types of bones, therefore making it gluten free. She said to not use any of the soy and hoisin sauces on the table, and to avoid the meatballs. Being a highly sensitive celiac, I was a bit apprehensive to try this, but when we arrived at the restaurant, I spoke with Helen and she had a great understanding of what gluten was, and that any small amount of it would make me sick. Needless to say, I had the pho with brisket and steak and felt great afterwards. Click here for more information about Ninh Kieu. Thank you Holly for this review. Gluten Free Edmonton always appreciates hearing reviews from fellow gluten free folks. How do you handle gluten free errors at restaurants? How do you handle gluten free errors made by restaurants in Edmonton? Do you call them out publicly? or do you contact them to help educate them? I'm hoping educating vs. calling them out is your method of choice. I just feel like calling out a restaurant publicly and possibly humiliating them or damaging their reputation may not be the right approach. After all, these restaurants do not even have to accommodate a gluten free diet, just like they do not have to accommodate other allergens. Calling out restaurants and restaurant chains may detour other restaurants from wanting to try gluten free meals because they will be afraid of backlash if something goes wrong. Amanda came across a situation while eating at Joey's. The wait staff just simply did understand the meaning of Joey's gluten free menu. She ordered the butter chicken from gluten free menu, and they came back with Naan bread. When they re-did the meal, it came back with tofu instead of chicken. I took the time to contact Joey's and let them know of our experience and the staff's understanding. We did receive an apology, and Joey's head office was happy that we contacted them. We were told that the locations general manager would be spoken to about their gluten free menu. We obviously had no way of seeing if that actually happened, but the next time we went our experience was 100% better. We even have a blog post about Earl's gluten free menu just not getting "it". But we've contacted them, voiced our opinion with them and let everyone know in the post, that although their gluten free menu may seem whacky, there are options you can have if you happen to be dining at Earl's one evening. Its up to us as a community to educate not only our friends and families about the gluten free diet and Celiac Disease, but restaurants as well. Look how far things have come in the past two years? More restaurants are popping up trying to accommodate the gluten free diet. We love it! And we still do our due diligence like you should, and ask questions about their gluten free menu "whats in the sauce? ", "is that rice pasta or corn pasta?" etc. Continued education is key! The more we educate, the more people learn, the more the restaurants understand and the more their staff will understand how the gluten free diet needs to be accommodated and potentially the more gluten free options will be made for the Celiac Community. Mark wrote in to tell us about Pampa Brazilian Steakhouse"
Basically, you get unlimited cuts of meat, and access to the salad bar. What they do is give you a disc, with a red and a green side on it. If you desire meat, leave the green side up, and it comes until you flip it to red, which signals stop. They serve beef, pork, lamb, chicken, done in different style - basically, if you wish, you can get stuffed to the gills! Basically that is the only option for dining there is - it's really a one-plate dining experience - which is unusual, but very unique. The servers come around with skewers of meat, and carve you the meat off the skewers right at the table for your plate. Very professional and courteous staff at Pampa as well. I wish I could tell you a bit more about the salad bar - it was good - some unusual items, but I really went only once to the salad bar, and was taken in by all the delicious skewers of meat coming by us! The set price for dinner was $45 per person, so after drinks and a tip, it came to about $150 for the two of us. This probably does seem pricey, but for me at least, I've not had such good cuts of meat for a long time, and now when we go to a regular restaurant that serves steak, it's purely second-rate for me in comparison. Personally, though, I'd recommend it to anyone as being gluten friendly (my wife was able to eat all the cuts of meat with no ill effects afterwards) and I really enjoyed it. To me, the only flaw I found with Pampa is that most other steak places are just pale in comparison! 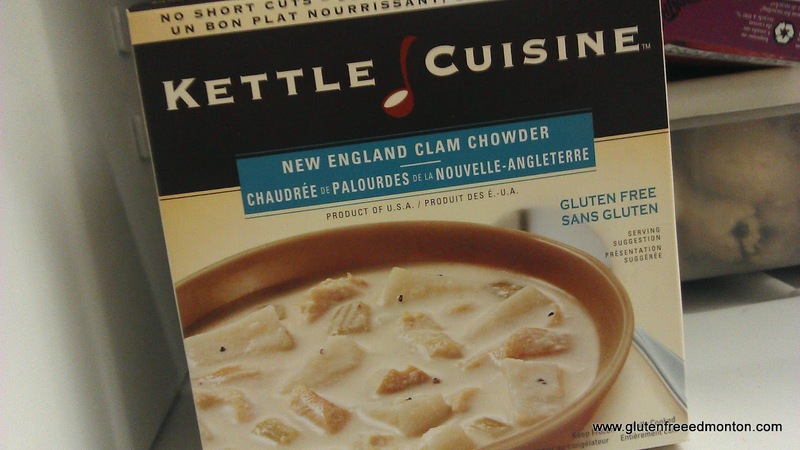 Kettle Cuisine has discontinued their individual frozen soups sold to consumers and will only be managing their gluten free soups for the food services industry. Click here to read more about from Kettle Cuisine. I was just at Ed's gluten free in south Edmonton and like always while my intention was to pick up just a few things I walked out with some extras. I cannot complain though about what I purchased, it's awesome! This brand of frozen gluten free soups comes in a variety of different flavors. They are individually packaged and if the others are anything like the Chicken Soup one....Watch out Campbell's your slogan is being borrowed "mmmm mmmm good!" "In 1986, Jerry Shafir founded Kettle Cuisine with the vision of creating great tasting soups for top quality restaurants. When Jerry learned that his daughter, Kate, needed to maintain a gluten free diet, he began to look for ways to cook wholesome, delicious soups that people on a gluten free diet could enjoy and feel good about eating. Today, we are proud to offer some of Kate's favorite Kettle Cuisine recipes, cooked with no compromise in taste and no gluten"
The first thing I said when I took my first bite was "holy, that's awesome. It tastes just like my moms chicken soup!" It was truly that good. I told Abisaac that if I had a bigger bowl of it it would be even better. While I appreciate the convenience of the individual serving size, I could have easily eaten a few bowls (or just a bigger bowlful). The chicken soup is full of flavor, loaded with pieces of obviously fresh not formed chicken and loads of carrots & celery. I found it to be the perfect blend of spices and seasoning. I often find that packaged soups are either way over spiced (particularly salt, ick) or they are lacking all spices and you end up spending extra time adding your own salt & spices and never get it just right. Way to go Kettle Cuisine, I love your Chicken soup. Thank you. Club House has some great tasting spices. We like to use their roasted red pepper seasoning on salmon. Such a great taste. When I bring left overs to lunch, I always get "what smells so great?". They are always surprised its salmon, since most people think fish can be pretty smelly. Mix red pepper seasoning in with vegetable oil. The seasoning should absorb the oil and turn pasty. Add some more oil if you want it more liquidy. Put on BBQ for 15-20 minutes or when the salmon becomes flaky. I put the salmon directly on the grill and leave straight for 15 minutes. Skin gets nice and crispy, edges do typically dry out, but I like that crunch. You can also wrap in foil and place on the BBQ or in the oven. The salmon will definitely be more moist that way. NOTE: Always be sure to check the labels of all the products used in a recipe. Manufacturers do occasionally change ingredients. 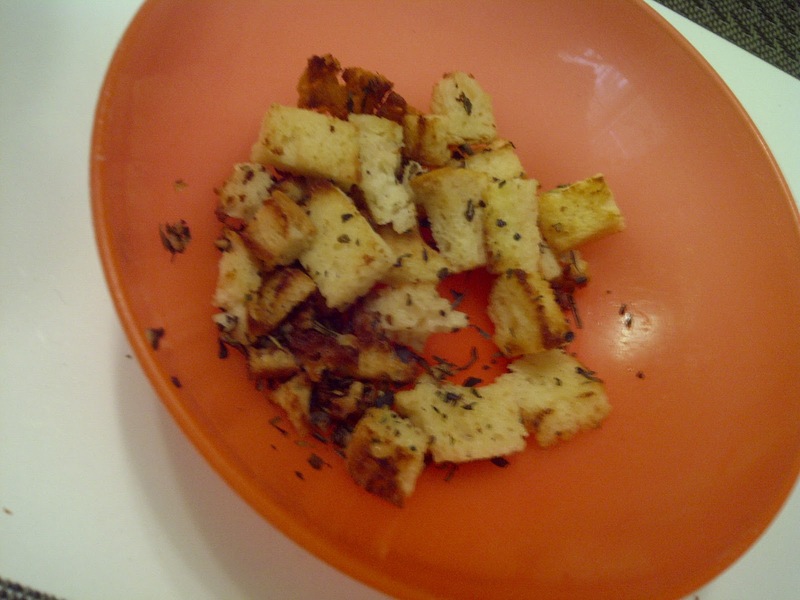 I haven't seen gluten free croutons yet anywhere, but Kinnikinnick's gluten free bread cubes are pretty close with a few minor alterations. Heat up the smallest fry pan you got. sprinkle more Italian seasoning and toss. Add more olive oil if required. It helps the seasoning to stick. Padmanadi is a popular all vegetarian restaurant located in downtown Edmonton. Orginally their gluten free menu options were low. However they have since worked on being more gluten free friendly for their customers with Celiac disease. Visit Padmanadi and let us know what you liked best.